Research projects dealing with the European history of coal; "environmental literary studies" and reflections on environmental changes during the era of industrialisation. 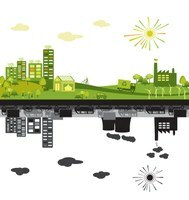 Project group: A Green City Mandate? The project is organised in cooperation with the Rachel Carson Center for Environment and Society at the Ludwig-Maximilians-Universität München (LMU). This interdisciplinary project group analyzes the relationship between urban development and environmental challenges in the postmodern era. We seek to understand how (and if) actors of urban planning responded to environmental challenges such as pollution, sanitation, and energy sustainability and in what ways responsibility to address these problems has been attributed to the “city level.” Studying contentious debates about environmental policies across multiple levels of governance, we want to identify relevant stakeholders, as well as agents’ respective realms of action, claims to responsibility, and sources of authority. Finally, focusing on selected case studies from Southeast Asia, Western Europe, and North America, we want to contrast and compare these findings in an international context. The project group will host a week-long graduate student workshop with two scholars from the United States and Asia, as well as a subsequent international conference on the topic. In 2018 deep coal mining will come to an end in Germany and with it an époque whose importance for the history of Europe since about 1750 can not be overstated. Coal influenced politics, the economy, society, and culture not only in Germany but also in the whole of Europe. It brought forth the industrialization, led to many strikes and conflicts, played a central role in both world wars and laid the groundwork for the European Community, which was founded in 1958 and which will have its 60th Jubilee in 2018. In addition, coal mining has also left deep scars and traces in both everyday and high culture, be it in customs, literature, films or the theatre. For a long time mining was seen as a male domain. However, today we know how important the contributions of women were and we also realize the gains that a gender perspective offers for the history of mining. While the era of coal mining will end in 2018, coal itself will continue to be used and imported into Europe for many years to come. Furthermore, the impact of coal on nature and the environment is likely to be felt for even longer, the increase in CO2 being just one example. The relevance and consequences of the age of coal, therefore, reach well beyond its quality as a resource for industry – as the planned book intends to demonstrate. Mating behaviour is expected to vary between and within populations in response to variations of social and environmental factors. Anthropogenic influences may directly or indirectly impact on the predictors of animal mating behaviour, for example through the removal of certain phenotypes, or through habitat fragmentation or climate change. The study of mating systems and of the factors affecting their variations plays a key role from a conservation perspective, because mating behaviour can influence effective population size, hence the ability of a population to maintain genetic diversity. The main objective of my research will be to provide a detailed analysis/discussion of the available information regarding the role of anthropogenic influences on the mating systems of mountain ungulates, a group of species that shows a variety of morphological adaptations to different environments and of social organizations. The successful pursuit of my main goal will depend upon the acquisition of a detailed knowledge of the mechanisms underlying mating systems of mountain ungulates and of the effects of anthropogenic disturbance on their life history traits. I therefore plan to adopt a 3-steps predictive approach, based on the fulfilment of systematic reviews that will aim to: a) provide a characterisation of the variation of mating systems within mountain ungulates; b) explore the effects of direct and indirect anthropogenic influences on the behaviour and life history traits of mountain ungulates; c) combine the body of knowledge gained from points a) and b) to investigate how anthropogenic effects can impact on predictors of mating behaviour. This project contributes to current research in the field of environmental literary studies ("ecocriticism") through a reconsideration of the relationship between ethics and aesthetics in Romantic and post-Romantic poetry of nature and place. While there is now a substantial body of ecocritical research on English Romantic verse, this project has a much wider geographical and historical reach, encompassing studies of both English and German Romantic ecopoetics, as well as examining the ways in which these European models have been translated and transformed in colonial and postcolonial Australia. In addition, this project will extend existing research in ecocritical theory by reflecting upon the status of nature writing in the era of the Anthropocene. On the one hand, the approach to be taken here will be “post-natural” in a double sense, presupposing both the cultural construction of our notions of “nature” and the anthropogenic character of our earthly environs. On the other hand, it will be argued that our cultural constructions are themselves dependent upon, and susceptible to being disrupted by, other-than-human material entities and processes. The key question to be addressed here, then, is what kinds of poetic practice might contribute to an enhanced awareness of both of the role of language in shaping human perceptions and of human moral and material entanglement with non-human others in an increasingly anthropogenic, and ecologically embattled, world? My research project focuses on a selection of long-forgotten caricatures that appeared in satirical magazines during the era of industrialization. These caricatures depict man made environmental transformations, address their consequences and implicitly demand environmental protection and thus a proto-ecological ethics. Usually neglected as mere illustrations in literary and cultural studies, their potential as a pictorial form of satire is greatly underestimated. However, as a medium of cultural criticism that inventively reveals problematic developments by combining text and image, it deserves more attention and a specific approach informed by intermedia studies. I intend to contextualise such caricatures with reference to environmental history, socio-political background and media history, as well as to offer iconographic interpretations. The aim is to decode and distinguish different modes of the artistic representation of environmental transformations and to assess their socio-political influence at a time when our world was less flooded with images than today. The outcome would not only comprise the exposure of untouched sources, but should be seen as an attempt to create a theoretical basis for the fusion of an ecocritical approach with analytical methods of intermedia studies.